NO MORE WASTING MONEY ON BATTERIES – EVER. FEATURES BUILT-IN RECHARGEABLE 1000MAH LI-ION BATTERY, 1000 cycles life, equal to 3000 AAA batteries, save your money and save the earth. UP TO 20 HOURS cordless reading without charging. Standard Micro USB CABLE included -Unlike Other Booklights. Your safety first. YOU WILL LOVE THIS SOFT PADDED CLIP LIGHT – Give it a try with our NO-FUSS 30 DAY MONEY BACK GUARANTEE & 1 YEAR WARRANTY – CLICK THE ‘ADD TO CART’ BUTTON NOW AND GRAB IT AT THIS SALE PRICE. SHIPS FROM THE USA. The Perfect Gift For Black Friday Reading Just Got More Fun! •Built-in 1000mAh Rechargeable Battery, making it fully cordless. • Power Up in 3 Ways: Free USB cable included, 5V phone charger. 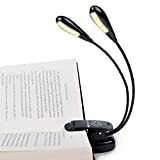 • 2 Flexible and Fully Adjustable Neck for ease of positioning your reading light. • 12 Bright eye-care warm LEDs and 6 Brightness Settings. • Gives Steady and Evenly Distributed Light, without hot spot or flickering. The Now I’m Reading! books offer a comprehensive approach that integrates the best of phonics and storytelling to help young readers take the first steps toward independent reading success. In LEVEL 1: ANIMAL ANTICS, children learn essential phonics skills while reading humorous stories featuring fun animal heros. Booklets 1-5 focus on mostly three-letter short-vowel words, some consonant blends, and early sight words. Booklets 6-10 progress to mostly four-letter short-vowel words, plus additional sight words and consonant blends. All the booklets feature hilarious pictures and stories that will have children excited to read them again and again! Would You Like Your Children To Enjoy Learning And Thrive At School? Would You Like Your Children To Settle Down and Do Their Homework Peacefully Without Meltdowns? If the answer to any of the above is YES – then this is for you! – How your child can become a super speller – and actually enjoy learning to spell! – How the child can de-stress, relax and remember what has just been learnt and supercharge their self-esteem. – The top 5 low sugar and sugar free recipes for snacks for children that allow them to concentrate better during school day. Reward Your Readers. Make reading extra fun with Mini “I Love Reading” Buttons! These mini pins make perfect rewards for children learning to read, reading competitions, and summer reading programs. Motivate children to read with fun favors that will remind them to pick up a book! 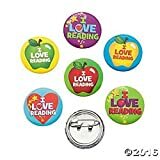 48 reading pins per package.Motivate children in your classroom, library, and home with positive favors, gifts, and accessories. There are 5 lessons and activities for each of the strategies for a total of 25 days of comprehension instruction. This is perfect for your reading workshop or guided reading classroom and is aligned to the Common Core Standards! Teach Your Child How To Learn Reading, Writing And Spelling – Aged 7-11 – From The Comfort Of Your Own Home! This book is for all parents who want to help their children aged 7-11 learn to read, write and spell successfully at school and at home. This unique, fun system is specially designed so that children can enjoy reading and spelling even if they might be struggling to read at school or have dyslexic tendencies. The first part of this e-book teaches you how to show your child how to write lower case letters. It progresses and teaches pre-comprehension skills, comprehension skills. It covers story writing, book reviews and thank you letters. Basic grammar is explained, aided by notes on a short poem. The Now I’m Reading! books offer a comprehensive approach that integrates the best of phonics and storytelling to help young readers take their first steps toward reading success. In LEVEL 2: AMAZING ANIMALS, children learn essential phonics skills while reading humorous stories featuring fun animal heroes—like an ape baking a cake for his date, a goat in a boat that won’t float, and more! Using an effective step-by-step approach that pairs patterned text with strong picture cues, the booklets in this collection introduce children to long-vowel sounds, consonant blends, word endings, and key sight words.